Old Master painting has never been more popular, as the crowds pouring into the National Gallery’s magnificent exhibition on Veronese vividly demonstrate. Like most public collections, the National Gallery has educational programmes designed to introduce children to the art of the past. But what if some eager teenager asks where it’s possible to learn the techniques that Veronese used? Where can a student study draughtsmanship, practise life drawing and be taught how to use oil paints? The answer is not to bother with art schools. During the past three decades, the stranglehold of a particular sort of art, largely conceptual in basis, has meant that their students won’t be trained in traditional techniques, even if they ask for them. However, the lessons of the Old Masters have been, for many years, taught rigorously and effectively in Florence by an American portrait painter. Charles H. Cecil studied in Boston with the American artist R. H. Ives Gammell, who worked in the tradition of John Singer Sargent. In 1983, he opened a school and, since then, a generation of realist artists has trained at the Charles H. Cecil Studios, based in the studio of the 19th-century sculptor Lorenzo Bartolini in the former Chiesa di San Raffaello Archangelo. Students follow a disciplined course of drawing from plaster casts before they begin on life classes, where they progress from charcoal to a strictly limited oil palette. The principal technique taught when painting a portrait is the ‘sight-size’ method, in which the artist places the canvas alongside the sitter and then stands back at a given distance so that subject and image are equal in size to the eye and the painting is seen to the scale of life. 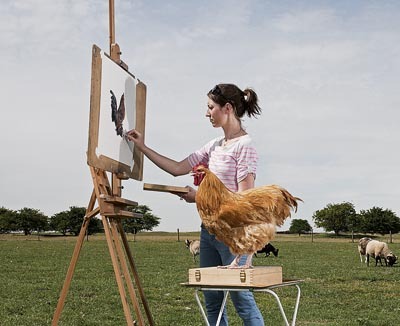 The technique was seen in action in a recent television documentary about Nicky Philipps’s painting of the Falklands veteran Simon Weston for the National Portrait Gallery-Miss Philipps constantly moved back from her canvas so that Mr Weston appeared to her at the same size as his image. Sara Stewart, whose company Fine Art Commissions represents Miss Philipps as well as several other distinguished portrait painters, has no doubt of Mr Cecil’s influence: ‘He has filled a vacuum. Although Mr Dewar is probably best known as an animal painter (‘I’ve got a thing about rhinoceroses at the moment’), he is unusual among Cecil graduates in putting the lessons he learned into challenging the Old Masters on their own ground. Thanks to a patron in Ireland, Mr Dewar has produced several large-scale religious and allegorical paintings. ‘Charles, to his credit, didn’t discourage this, but he was realistic-large compositions are mind-bogglingly testing.’ But without a training of the sort Mr Cecil provides, who could hope to succeed? Unusually, Mr Church wasn’t a student-he’d already had his first exhibition-but his background was in graphic design and illustration, not fine art, simply because he’d been unable to find any art school that would let him study traditional techniques. At the end of her three years in Florence, Imogen Man heard Mr Cecil lecturing. ‘He commented that all the British girls who come here go back to England and start painting dogs. I don’t think he was very impressed.’ As soon as Miss Man returned to London, she was commissioned to paint a dog and that’s what she’s done ever since, with great success.